A recipe for candied pumpkin aka Calabaza en Tacha. 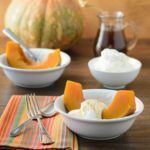 Calabaza squash (West Indian Pumpkin) is cooked in a sweet syrup and served with whipped or ice cream. Cut squash in half. Scoop out and discard seeds and stringy flesh. Cut squash into 12 wedges or 3-inch pieces. Add 8 cups of water to a large heavy-bottomed pot or Dutch oven. Add brown sugar cane cones and bring to a boil. When sugar dissolves, stir in orange juice, zest, and cinnamon sticks. Add the squash wedges and return to a boil. Reduce heat to medium-low. Loosely cover and simmer until squash is completely tender, about 30 to 40 minutes. Transfer the squash to a platter using a slotted spoon. Cover squash with foil. Remove and discard cinnamon sticks. Strain liquid into a bowl to remove cinnamon bits, zest, and any solids. Pour the liquid back into the pot and bring to a boil. Cook until liquid reduces to a syrup (similar consistency to maple syrup), about 30 to 45 minutes. Serve squash warm or at room temperature. Drizzle squash with syrup and top with whipped cream or ice cream if desired. Calabaza squash is also called West Indian Pumpkin.